^ Died on 10 March 1592: Michiel van Coxcie (or Coxie, Coxius) I the flemish Raphäel, Flemish painter born in 1499 who studied under Bernaert van Orley.  Flemish painter and engraver of religious subjects in the Raphaelesque style adopted after he visited Italy with his master Bernaert van Orley. In all likelihood he was born in Liège, but very early in his career he must have settled in Mechelen because, in time, they treated him like a native son. Like so many Flemish artists, he travelled to Rome where many of his works are still on display at the church of Santa Maria dell'Anima. 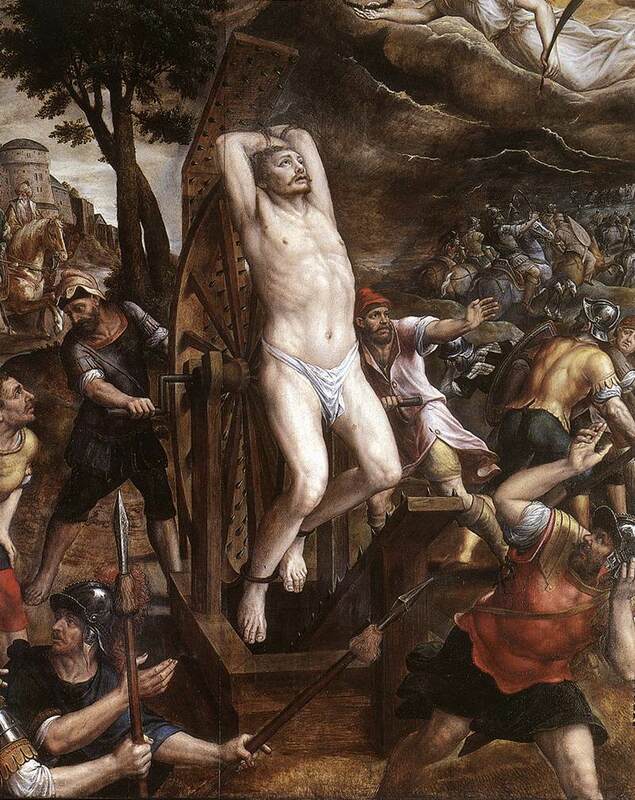 Upon his return in Mechelen he went right back to work and did not stop until his dying day. He created more than a hundred large paintings, countless designs for tapestries, etchings, and drawings. During his career, he became the favorite of Charles V and Philip II. For the latter he copied the Van Eycks' altarpiece The Adoration of the Lamb. Although in his day they called him the "Flemish Raphael", he is now considered a Romanist and a compulsive imitator of the Italian style. Admittedly, his style did not evolve much over time but he remains an important link between the Flemish primitives and the Baroque at of Rubens. He had many sons, some of whom walked in their father's footstep without ever reaching his level. The most famous among them were Michiel van Coxcie (III) the Younger and Raphael van Coxcie. 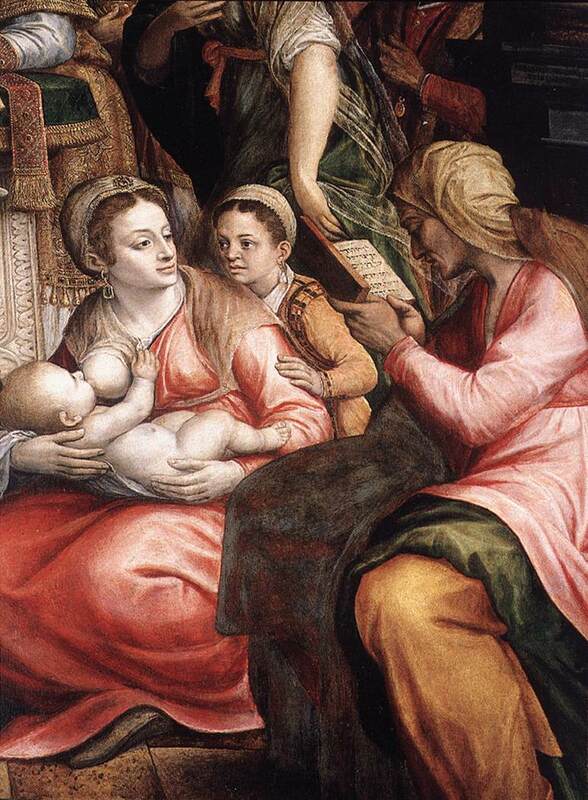  The Circumcision of Christ (detail) (1585) _ This detail shows the corner of the panel in which sits a sibyl. This figure was inspired by Michelangelo's painting on the ceiling of the Sistine Chapel.  The Torture of St George (1586) _ This panel is one of the wings of a triptych in the Mechelen Cathedral depicting the Martyrdom of St George. A remarkable detail about this triptych (and another triptych in the same Cathedral depicting the Martyrdom of St Sebastian) is the fact that the artist was well into his eighties when he created them. 1871 Anton Einsle, Austrian artist born in 1801. 1856 Ludovico Lipparini, Italian artist born on 17 February 1800. 1745 Jan-Peter van Bredael I, Flemish artist born on 28 April 1654. 1946 Gérard Garouste, French artist. 1853 Luigi Rossi, Swiss artist who died on 06 August 1923. 1843 Hugo Oehmichen, German artist who died in 1932. 1789 Augustin Alexandre Thierrat, French artist who died on 13 April 1870.